In 2017 we shared a list of our fave feminist podcasts which were helping us get fired up for the #resistance. Well 2018 is here, and it’s time to make a new list to add to our feminist ear candy! This year, as we continue to use our platform to elevate the stories of women fighting feminist battles, we recognize more than ever how podcasts are a great and convenient way to stay informed, get educated, and feel empowered as part of a larger community passionate about equality. 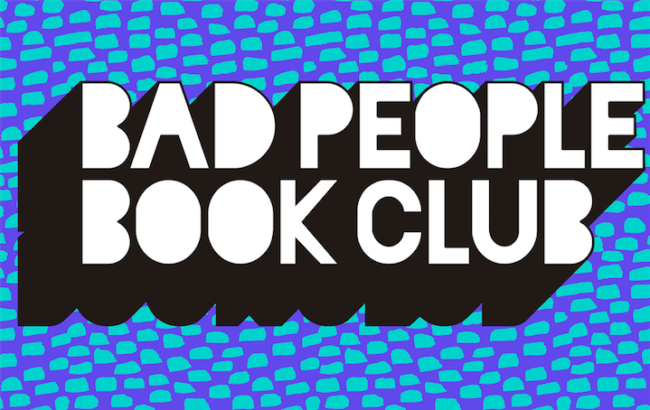 The first podcast, and a new series that recently came across our radar is ‘Bad People Book Club’, created and hosted by Abbey Jones, co-hosted by her bestie AJ, is also a subscription book service for people who like to read, but also party! Each month they send their subscribers a book along with a cocktail recipe and ingredients in the theme of the book. They select books by women focusing on issues of race / gender / identity. Abbey is an American Indian from the Lakota tribe in South Dakota and AJ is a black Puerto Rican. Representation is something that drives a lot of their conversation in general, whether it’s through books, movies, or podcasts. When the duo started this project, they didn’t necessarily set out for this to be one of the key points of difference however, it seemed to make sense given that they were both attractive to narratives from women of color. It’s especially so important given our current political climate for women and people of color to have a safe space where their stories and voices are reflected, and that’s what ‘Bad People Book Club’ offers. Our second feminist podcast is a fairly new series called RePROs Fight Back, hosted and created by Jennie Wetter, who is based out of Washington DC. As the name suggests, the podcast is about all things reproductive rights, which has never been a more timely subject than now. Sexual and reproductive health and rights are under an escalating assault, both at home and abroad, and this podcast is about meeting at the frontlines – and fighting back. In each of the episodes so far, Jennie interviews a leading reproductive rights advocate or healthcare expert to talk about topics such as birth control and the implications of Trump’s expanded Global Gag Rule. This podcast is informative and helps us realize how important facts are in the current fact-free, ideologically-driven climate. You can subscribe to this podcast on Apple iTunes, Google Play, or Stitcher, and listen to the episode discussing the Global Gag Rule below. In the interest of staying informed about reproductive rights and the legislation surrounding it, we have really been digging Rewire news’ ‘Boom! Lawyered’ podcast, hosted by the media platform’s #TeamLegal minds Imani Gandy and Jessica Mason Pieklo. Also, you should follow BOTH of these badasses on Twitter for their constant updates about what is happening each day in Congress in terms of reproductive rights laws. While they cover a few different topics including immigration and other equal rights-based measures, their episodes discussing anti-choice protests outside abortion clinics and the law surrounding those, how the US Supreme Court bench could vote on certain major upcoming cases, and how extremist anti-choice organizations who have a history of violence are ramping up intimidation tactics around the country. If you’re looking to get a little nerdy but informed, especially as we look ahead to the mid-term elections this coming November, be sure to subscribe to the ‘Boom! Lawyered’ on Apple iTunes, Google Play, Stitcher, and Soundcloud. Listen to the episode below where Jessica and Imani break down how ‘The Handmaid’s Tale’ is becoming more of a reality every day in America, and what we can do as voters to stop this. After getting your regular dose of legislative info about reproductive rights, it’s also important to remember that issues like abortion are very person and affect people in different ways. This is where our next fave podcast comes in. The Abortion Diary is a series created by Melissa Madeira who hails from NYC. Ever since coming to terms with the shame and stigma after having her own abortion, she realized she wanted to ensure other women didn’t have to feel alone or condemned for their decision and started this series in 2013. It took her 13 years to even find the confidence to share her own experience, and now since launching the podcast and speaking to women all over America, and around the world where safe and legal abortion access is also under threat, she has recorded close to 300 stories that all contain the type of nuance we need to see more of in general discussions about abortion. If you are looking for a compassionate, realistic perspective on abortion away from divisive political and ideological rhetoric, listen and subscribe to The Abortion Diary on Apple iTunes, Google Play and Soundcloud. Listen to a recent episode below of a woman’s experience trying to obtain an abortion in Louisiana where people have to jump through a number of legislative and procedural hoops just to get the care they need. The 5th podcast we have on our “must listen” list for 2018 is ‘Hellbent’, created and hosted by progressive political pundits Sarah Lerner and Devon Handy. The duo started the series in the wake of the 2016 Presidential election and make no qualms about sharing how they really feel about Trump and the Republican party. They cover the latest political news each week from Trump’s horrendous executive orders like the transgender military ban and rescinding Obama’s birth control mandate as part of the Affordable Care Act. Each episode is divided up into sharp segments of easily digestible political news of the moment to help you stay informed about what’s happening on Capitol Hill, cable news, Twitter, and on the streets where organizations are working overtime in the #resistance. Our fave part of Hellbent, along with the fact they are a feminist podcast which also amplifies the voices of women of color wherever possible, are the interviews. They have spoken to former Texas state senator Wendy Davis, Moms Demand Action founder Shannon Watts, feminist writer Melissa McEwan, and Georgia Democratic Gubernatorial candidate Stacey Abrams, which you can listen to below. Subscribe to ‘Hellbent’ on Apple iTunes and Google Play.